We've moved our Blog! For the latest appraisal news, insights and market trends in Philly and the surrounding markets, visit our new blog at www.phillyappraisalblog.com or click the page view below! The Coyle Group is pleased to announce the launch of our new website, phillyappraisalblog.com !! The site was created to bridge the gap and encourage communication between appraisers, real estate professionals and those searching for reliable information about real estate trends, appraisal issues and neighborhoods around Philly. The phillyappraisalblog.com (PAB) will be updated on a regular basis and will feature case studies, analysis of current market trends, interviews with local experts, advice on property value and neighborhood overviews. PAB will also give our readers the opportunity to get specific market data and analysis on markets and neighborhoods that they request. Look for the Ask PAB feature in weeks to come. This interactive feature will allow you to get expert answers to questions like..."What is pricing trend for 4 bedroom homes in Blue Bell?"... "What is the average days on market for a rowhouse in Mayfair?"... "How many short sales are occurring in Philly and the surrounding counties?" Visit PAB now to subscribe! Thanks for all your support! Continued good luck in 2011. Neighborhoods can be as small as a few square blocks or cover large sections of the city. One such neighborhood is the Roxboro section of Philadelphia. It occupies much of the northwestern portion of the City abutting Montgomery County, along with Manayunk and Chestnut Hill. It has always been a solid, working class area with strong family values and sensibilities. The staple of the Roxboro housing stock is the three bedroom, single family attached rowhome or townhouse. Many were built to satisfy the housing needs of the local factory workers and to keep up with urban sprawl. Depending on which part of the Boro you are talking about the homes were generally built between 1865 and 1970. These are still very popular housing choices for first time homeowners and investors. Below is a chart of the sales activity of the typical 3 bedroom Roxboro Row over the the past four quarters (2009 Q4 – 2010 Q3). As you can see, the number of sales spiked to 36 in 2010 Q2. This is a direct result of the tax credit that was being offered to first time homebuyers. The three bedroom Roxboro Row was essentially made for this program due to its attractiveness to first time buyers and those targeted buy the tax credit program. You will notice that in 2010 Q3, after the sunset of the credit, sales of the Rows dropped off by more than 60%, which was just where sales were prior to the credit program. The next chart compares the Average and Median Sale Price for three bedroom Roxboro Rows over the same time period. In 2010 Q1, the Average Price spikes up to $271,042 despite only 12 sales during that quarter. The reason for the skewed average is two or three higher sales of newer townhouses that pulled the average up. Note that the Median Sale price tracks right along with the other quarters. The Median Sale Price for Roxboro Row has hovered between $204,900 in 2009 Q4 to a high of $214,500 in 2010 Q1. In 2010 Q2, the median began to settle into a more traditional trend eventually getting back down to $205,250 in 2010Q3…almost even with where it was in 2009Q4, prior to the tax credit. It goes to show, that despite government interference with credits and incentives, the markets will correct themselves. It also goes to show that the Roxboro Row is the backbone of this market and can withstand outside market influences. Perhaps that’s why it’s been around for so long and continues to show consistent and measurable value. Appraising in Philadelphia, typically means that from time-to-time you will appraise a property for an FHA insured loan. That invariably brings up questions from realtors, lenders and homeowners about FHA Guidelines and, more specifically, those guidelines pertaining to distressed paint. The FHA guideline for peeling, chipping, “alligatored” and otherwise distressed paint on a residence is pretty straightforward. In 1978, paint manufactures stopped using lead in their products. This was in reaction to studies that indicated lead paint was a contributor to a myriad of health issues among children and adults. It falls into the category of being a health issue. FHA doesn’t like issues that could affect the health or safety residents. So if a house was built prior to 1978, it can be assumed that there is lead based paint present. Given the age of the housing stock in Philadelphia, you can see what an issue distressed paint can be since the vast majority of Philadelphia’s homes were built prior to 1940. If that paint is chipped, peeling, “alligatored” or otherwise distressed, the FHA Guidelines state that it must be properly cured. The FHA publishes guidelines on exactly how to properly cure lead based paint issues at a house. Does that mean that homes built after 1978 are in the clear when it comes to distressed paint? Well, yes and no. Yes, they are in the clear as far as the health and safety issues brought about by Lead Based Paint...and No, because if there is distressed paint (especially on an exterior surface), it can become an issue that would diminish the economic life of a property, especially if there is exposed wood that would be prone to decay if not properly painted. 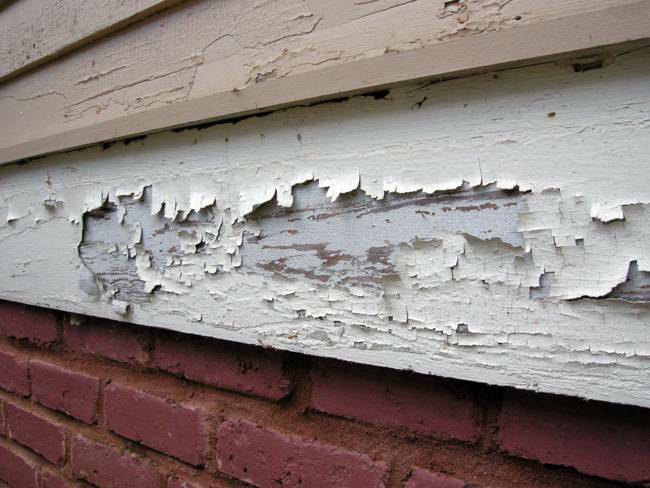 Distressed paint in a post 1978 house would also need to be properly cured. Hopefully, this information will be useful to you. If you have any other questions regarding FHA insurability and guidelines, please feel free to call our office. Recently, one of our appraisers was visiting a house in a suburb of Philadelphia. The homeowner was very proud of the fact that the house was entirely "off the grid" in terms of electrical power due to the installation of solar panels. In fact, the property owner was receiving money from the electric company for energy he generated and sold back to them. Money back from the electric company...not a bad deal! The initial investment to install the solar panels was roughly $40,000, less State and Federals rebates credits, the net outlay was around $15,000. Weigh that against the monthly savings and the money received for selling power back to the electric company for as long as you own the house. One issue that came up during the appraisal was how to value the panels. There is very little market data that would indicate that solar panels add any measurable value to a property. Another issue was whether or not the market recognizes this feature as a positive or a negative. Some would argue that the aesthetic appeal of the house is adversely impacted by the panels to such a degree that any value the panels may add would be offset. That being said, would panels be more acceptable if they were installed in the yard rather than on the roof? As more and more homes with this technology are built, sold and resold in the Philadelphia region, we will have a better understanding of the value, if any, that solar panels have on a house. Until then it's really a matter of personal preference. What's your opinion? Are solar panels a Plus or a Negative?